BRUSSELS, Belgium (CNN) -- The United States is calling for a conference on Afghanistan and the broader regional challenge to take place March 31, Secretary of State Hillary Clinton announced Thursday. 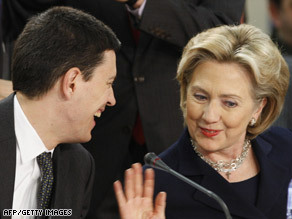 British Foreign Minister David Miliband and Hillary Clinton talk Thursday at NATO headquarters in Brussels. Clinton made the announcement in her first address as secretary of state to the North Atlantic Council at NATO. A senior U.S. official told reporters, "I would expect that Iran would be invited." Ministerial-level officials would participate. Clinton did not name a location for the conference but said the United States is discussing this now with U.N. Secretary-General Ban Ki-moon, including whether the U.N. would chair the meeting. Clinton said that Afghanistan must be seen as a single strategic concern and that a small area in that region is now a "nerve center for extremists." The situation on the ground right now, she said, is serious. She called for better coordination within the U.S. government, with NATO and with the international community. She said a better-integrated civilian and military strategy is needed. "Any long-term solution," she said, "will require the participation of Afghanistan's neighbors," but she did not specify any of those countries. Clinton said the second-most immediate challenge for NATO is "to forge a more constructive relationship with Russia and a stronger consensus about our relations with the emerging nations of Europe's east." As for Russia, she said, "it's time to explore a fresh start." However, in comments certain to anger Russia, Clinton said that NATO should continue to hold open its door to membership for Ukraine and Georgia. The North Atlantic Council, in a late addition to its schedule, held a meeting of the NATO/Ukraine commission and the NATO/Georgia commission. Russia is not a member of NATO but is a member of the NATO/Russia Council, formed in 2002. It consults, coordinates, reaches joint decisions on and carries out joint action with NATO on areas such as terrorism, cooperation on Afghanistan and military exercises. The North Atlantic Council has political authority and powers of decision for NATO.